Gems are the works of one of the oldest arts – the glyptic. It was born in the most ancient civilization on the Earth, Ancient Sumer, as an art of miniature carving on colored stones. In those times colored stones had sacred meaning and only elite could own them. It was considered that a symbol carved on a stone intensifies its magic power. As well men started to use stones with carved symbols and images on them as stamps that leave a print on soft materials such as wax or clay. Gradually the art of glyptic extended on all Mesopotamia, came to Egypt. Here we must to distinguish especially the most common in Egypt carving of miniature scarab beetles, which had mystical meaning for Egyptians and were used as amulets. The art of glyptic was highly developed in ancient states: in Greece and then in Roman Empire. Gems, carved stones, were immensely valuated there and were the most expensive adornments. As far back as in second millennium B.C. the art of glyptic got to the ancient Hellas. Local artists carved wonderful intaglios, gems with a convent mirror image, designed for making stamps. After the long period of decadence the art of glyptic reappears in Greece again in the middle of the first millennium B.C. Gems became the most expensive adornments and embodiment of the beauty of nature. In the fourth century B.C., in the Hellenic period, the masters of glyptic developed a new kind of gems – cameos. 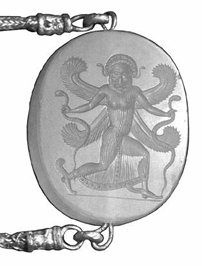 Unlike intaglios cameos had a relief image. Cameos were not used as stamps and in the full sense were the expensive adornments. Gems were vastly widespread in Roman Empire, where the art of glyptic had very high level of development. Just emperors and very wealthy aristocrats could afford to have their own dactyliotheque (Greek dahtylo – finger) – a collection of gems. Wonderful dactyliotheques were in own of Julius Caesar. “He always bought up carved stones with great enthusiasm” – as Svetoni wrote about him. We have little information about the majority of antic artists. The history gives us only the names of some of them. 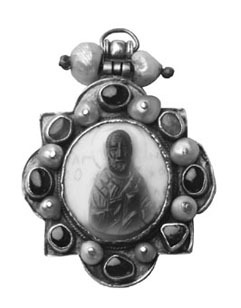 This is the outstanding intaglio carver Dexamenos of Chios who lived in the fifth century B.C. ; Pirgotel – the author of the portrait of Alexander the Macedonian; the skilled Greek carver Diodorus of Samoss well-known for that he carved a lyre, surrounded by a swarm of bees, on five-layer sardonyx. 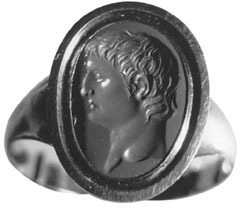 The stone was inserted into the ring and cost the same as the native island of Diodorus. Famous Roman carver Dioscorides was the author of the portrait of Augustus. With the decline of Roman Empire there began the decadence of glyptic. The forms became crude, comes back the old mystical perception of gems, when a little symbol or a schematic sketch was enough for intensifying the magic power of a stone. At the same period there occurred the decay of antique outlook; it gradually changes on a new – Christian ideology, more concentrated on an inner life of a human. Christian iconographic subjects gradually began to enter into the glyptic. Especial flourish of Christian glyptic was in Byzantium – the successor of Roman Empire. The expressiveness of cameos-icons’ images in combination with a very high technique of work delights people till nowadays. Byzantine tradition of Christian glyptic had a very big influence on neighboring cultures. 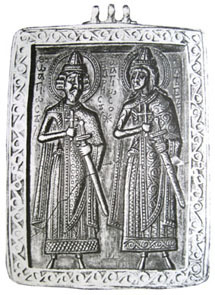 Stone relief icons were carved in all orthodox Slavic countries, in Transcaucasia and in the Christian Near East. There were Byzantine workshops in Italy. Here talented artists made a lot of wonderful works. The tradition of Christian glyptic gave an impulse to development of Italian Renaissance glyptic, when masters began to copy antique gems. After the adoption of Christianity the carving of cameos-icons came to Kiev Rus. Cameos were very popular here. Notwithstanding they were carved here on soft kinds of stone, they were very expensive adornments because their making needed individual authoring work of an artist. Therefore only solvent groups of society could have them; they were princes, boyars, the secular clergy and rich merchants. In the Western Europe the glyptic revives again from the beginning of the epoch of Renascence. This was preceded by the interest for preserved antique gems that were highly valued. For example, a passionate antiquarian, Pope Paul II, had promised the abbey of Saint-Sernin in Toulouse to build a bridge across the Garonne River, in exchange for “a cameo of August”, but the chapter of the abbey considered that the price is not high enough and the deal did not take place... The founders of the Renascence glyptic were the Italians Vittorio Pisano and Donatello. The outstanding sculptor and goldsmith of the era Benvenuto Cellini also was making gems. The new flowering of glyptic began in the eighteenth century, when production of gems accompanied by collecting of ancient works of this art. The interest for the glyptic at the Russian royal court is particularly noteworthy because by this was created the world’s richest collection of antique gems that kept in the Hermitage now. 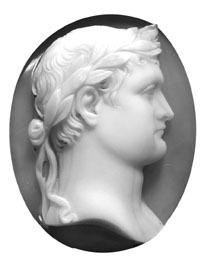 Cameos were very popular at the court of Napoleon; the most valued were cameos-portraits, and even the emperor immortalized himself in stone. The last significant rise of glyptic was at the era of modern when brooches with cameos made of flaky stone or seashells were very popular. Today glyptic is going through another birth. Glyptic has thousand-years of history and truly considered as an eternal art. The majority of ancient works of painting, sculpture and architecture did not reach to the present day, and just small gems, carved on solid gemstones, often serve as an evidence of entire eras.